After receiving word from Fabric Mart that I could make up McCall's 6884 in the beautiful olive, brown, and silver wool sweater knit that I fell in love with over at their site, I decided that an outfit was in order, and that I would make the other pieces of this outfit. I had some stash fabric for the tunic/top I made, but I knew I wanted to make an a-line skirt of something very fall-like, but that also wouldn't cost me a pretty penny to buy. Literally the next day after receiving word that I would be using the sweater knit, I saw that a "buy the piece" Shetland wool in a pink and brown houndstooth came up for sale. I love Fabric Mart's "Buy the Piece" category, there are some amazing hidden gems there. You don't get to choose the yardage, but all the pieces in that category are super discounted. For instance, this bit of pink and brown Shetland wool normally sells for $25 a yard (though it is on sale today for $15--woo! ), but the "buy the piece" I bought was for $10 for 3/4 yard. So quite a bit of savings! And after I received it, I noticed that the cut was closer to 7/8 yard, so a bit of a bonus on top of it. So after you count in the fabric costs, this skirt comes to around $15, since the lining came in a free bundle from Fabric Mart and the fabric on the waistband was from my stash (and I only used the wee-est amount). I would call that a successful sewing project. I know for a fact skirts like this, fully lined, with pockets, and in a thick Shetland wool (seriously so thick and warm), retail for closer to $100 and more at places like Boden and J. Crew. On sale, at the very end of the season, you might be able to get a skirt like this for closer to $50, but by then all the sizes and colors have been picked over, especially ones in a fun color like this one is. ;-) Yay for sewing! 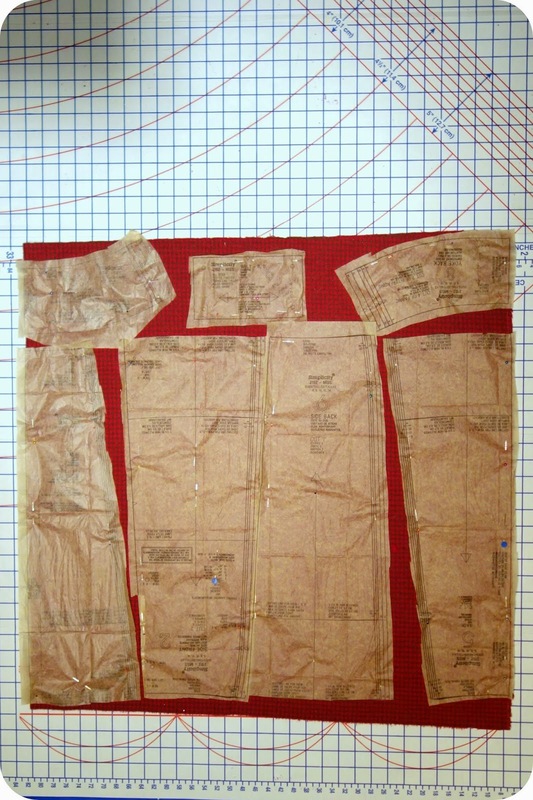 The one issue I had, and it is minor, is that I did have to carefully choose both the pattern I wanted to use and the placement of the pattern on the fabric. I didn't want a pencil skirt, I knew I wanted an a-line, so that immediately limited me. 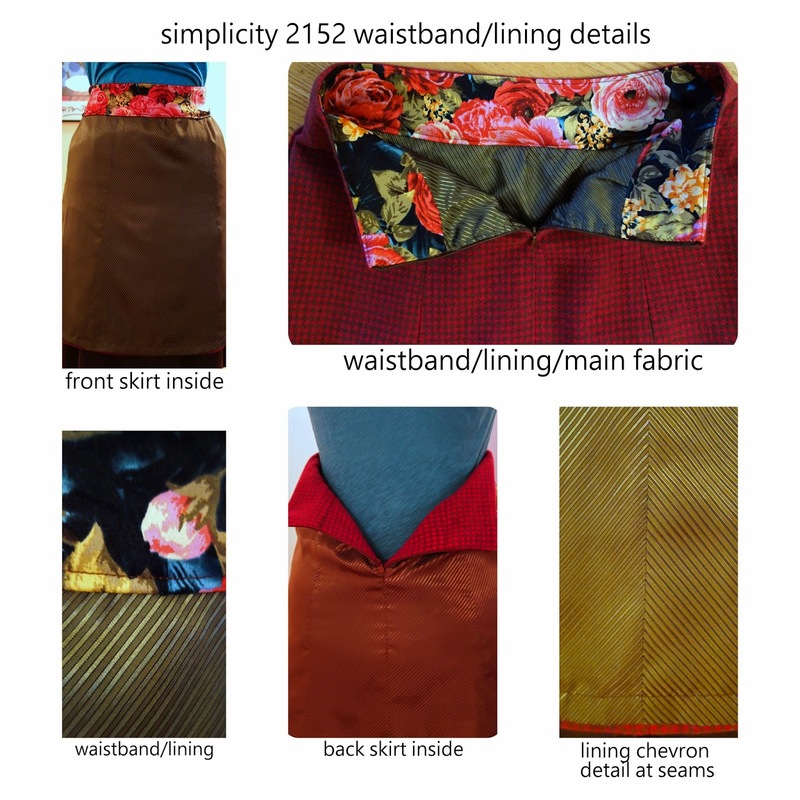 Many of my a-line skirt patterns are too full and so would not have worked with this amount of fabric, but Simplicity 2152 (http://www.simplicity.com/p-6164-misses-skirts.aspx) is a perfect a-line silhouette, a bit fitted at the top and flaring towards the hem. I was making this skirt up at the same time that Sewing Pattern Review was having their a-line skirt contest (http://sewing.patternreview.com/Patterns/68967) and I kept wondering which of the beauties I saw were based on this awesome (but sadly out of print) pattern. Unfortunately I didn't have quite enough fabric for the patch pockets the pattern calls for, but I figured I could add inseam pockets to the skirt from the lining. That worked out fine, though they gap a bit. I definitely plan on using the patch pockets next time I make this pattern up. Fortunately my lining fabric looks really nice with the houndstooth wool, so it is just a cool flash of contrasting fabric, but because I am persnickety, it does bother me a touch. 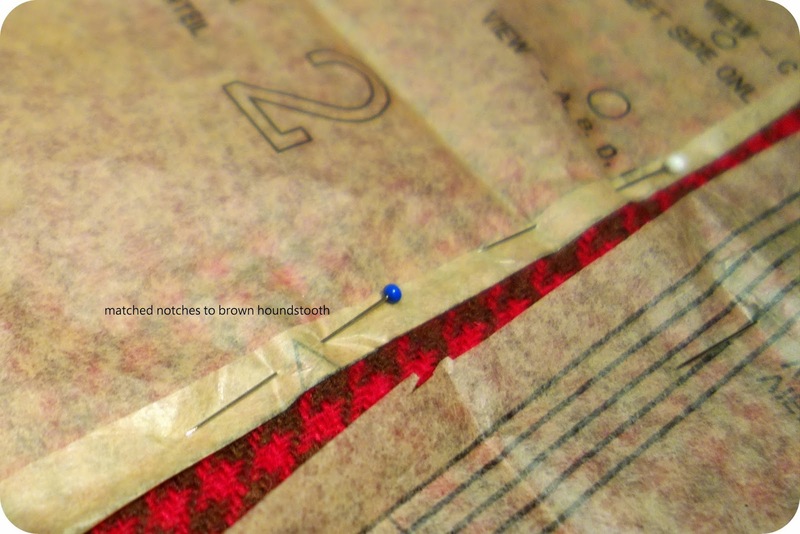 One of the things I did have to be careful of was placing the houndstooth properly with the pattern pieces. In the end I chose to match brown houndstooth to the singular notches, and surprisingly, it worked quite well. There are only a few places where the houndstooth doesn't line up, and overall the effect is that the plaid is properly aligned throughout! Yay! 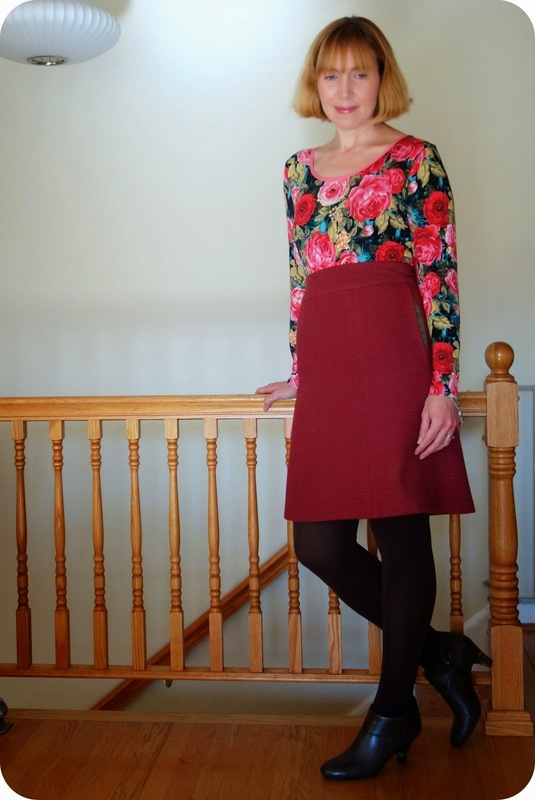 The skirt pattern is flattering for all shapes, but I love it on my pear shape since it highlights my narrower waist but gently falls over my larger hips and thighs. I do have a very high waist and all skirts start super high on me, if the waistband is fitted. I don't mind how high it hits on my body, but I want to emphasize that on most women, the waistband will fall much lower. I made the view C of this skirt, and though it is meant to be almost knee-length, even with a 5/8" hem allowance, it falls above my knees. Again, most women won't have to worry about this. It is particular to my 5'8", high-waisted self. I made up the size 14, and it fits fine. There are a lot of seams in this project, and if you so desire, the seams can be used to better fit this skirt to your particular frame. The seams make sewing it up take a while longer (especially if you line it and use the same pieces as your basis for the lining), but again the time is worth it. Seems most of my sewing ends with the phrase, "but the time was worth it!" LOL. Anyhow, I hope that you all will consider looking in the "buy the piece" category, especially at the smaller cuts! It is possible to make something for you from these, you just have to be very crafty and careful with what you choose! Aw, thanks! :) Okay, so do the diet, but then dive right back into the buy the pieces. I would love to see what you would make up!